Inspired by this seaside setting, Philip Hooper Moore created and opened White Point in 1928. In the decades since, ownership may have changed, guests have come and gone, but 90 years later this seaside oasis has remained, seducing all that have stayed. Inspired by the surroundings that envelop White Point and the 7400 km coastline of Nova Scotia, SEA’spired is a celebration of the sea. 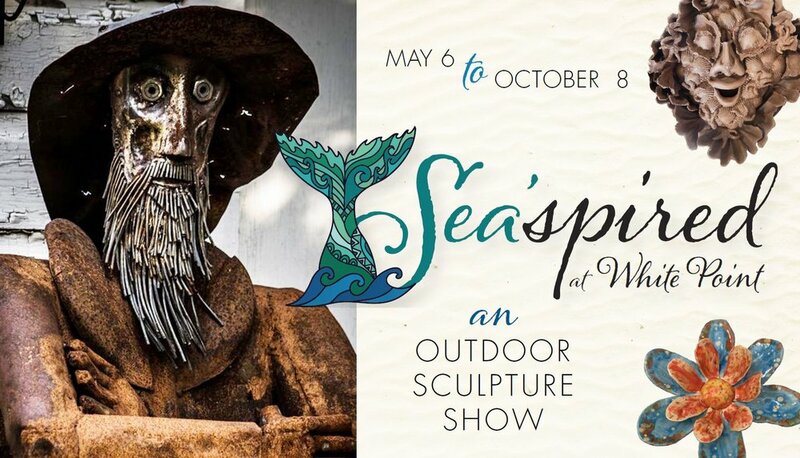 Starting May 6th with the Grand Opening at 2pm and continuing until Monday October 8th, we invite you to meander and stroll along the shoreline to discover more than 30 sculptures by a collection of 18 Nova Scotian Artists. White Point Beach Resort is proud to have the opportunity to collaborate with this collection of Artists in presenting this intimate and unique presentation of their works in our outdoor gallery, in honour of our 90th Anniversary. Curated by our Gift Shop Manager, Cathie Pincombe, this show promises to be one of the most dynamic to be enjoyed in 2018. Our goal was simple – invite local artists, of all mediums, to assist us in celebrating the Atlantic Ocean in an interesting and unique manner that would entice our guests to really explore and discover a new way to experience our perch here along the edge of the ocean. We are so thrilled to be showcasing works by so many incredible Artists, some have been Artists of White Point for years in our Gift Shop and at our Artists of White Point Showcase in November, while most are new to us!